Asking just $18.00 -- MUST SELL -- Make me an Offer !! Buyer to pay U.S. Shipping, or item can be picked up. Cash or Money Order only. NEW in the Box Barbie ! Makes a Great Gift !! 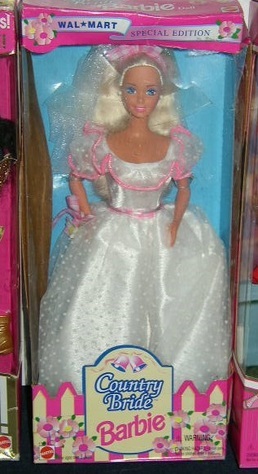 Wal-Mart Edition Country Bride Barbie - 1994 Mattel (#13614). Unopened Box with Accessories, including: Barbie Doll, Dress, Veil, Daisy, Shoes, & Hair Brush ! Also selling 1980's Barbie Doll with Accessories & Clothing, & Vintage, Barbie Furniture, & Other Items too ! See them & all my items posted for sale in my online store !